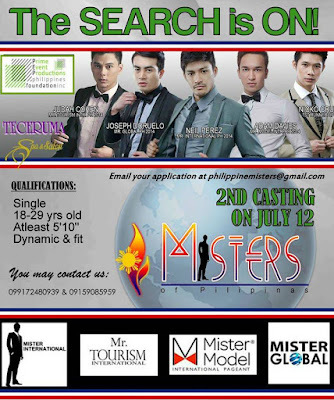 Misters of Pilipinas 2015 has announced its 2nd casting to be held on July 12, 2015. This pageant is open to single male, 18-29 years old and stands at least 5'10". Email your application via philippinemisters@gmail.com on or before July 11. Kindly include your full name, age, height and contact number. For inquiries, you may contact: +63.917.2480939 or +63.915.9085959.